We don’t expect much from pure-utility UTVs. We expect them to get the job done, but we also expect them to be slow with suspension that can be overwhelmed by anything beyond mild speeds or terrain, and we don’t expect them to be very comfortable or quiet. 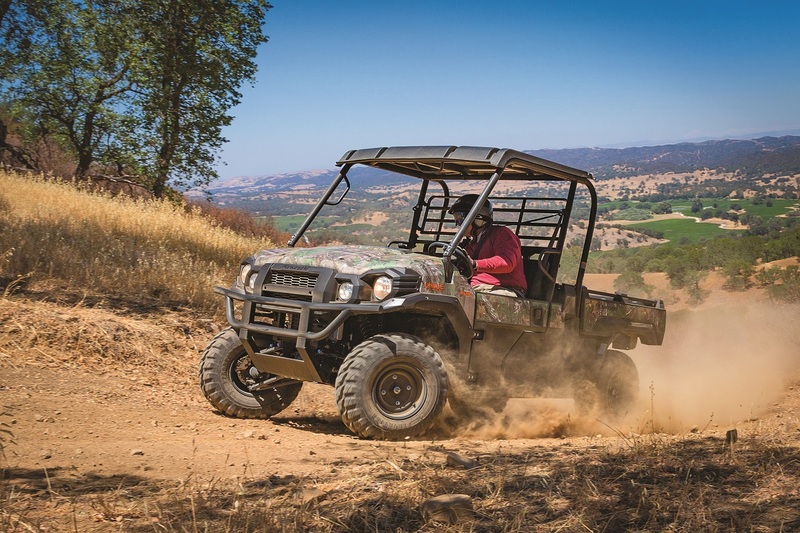 Like some other modern utility UTVs, Kawasaki’s new Mule Pro-FX is all about changing the utility UTV concept, like fast, quiet, comfortable, modern pickups changed everybody’s expectations for trucks. Selectable 2WD/4WD lets the Mule Pro-FX conquer challenging terrain, and its unlockable rear differential is kind to delicate turf. It’s the new three-seat version of the Mule Pro-FXT, with a huge 54.1 by 53.3-inch tilting bed that can hold a standard-size pallet and carry 1000 pounds. The Mule Pro-FXT can seat six, or be converted to three-seat capacity to expose its 42.7 by 53.7inch bed. The Pro-FX can also tow a ton. 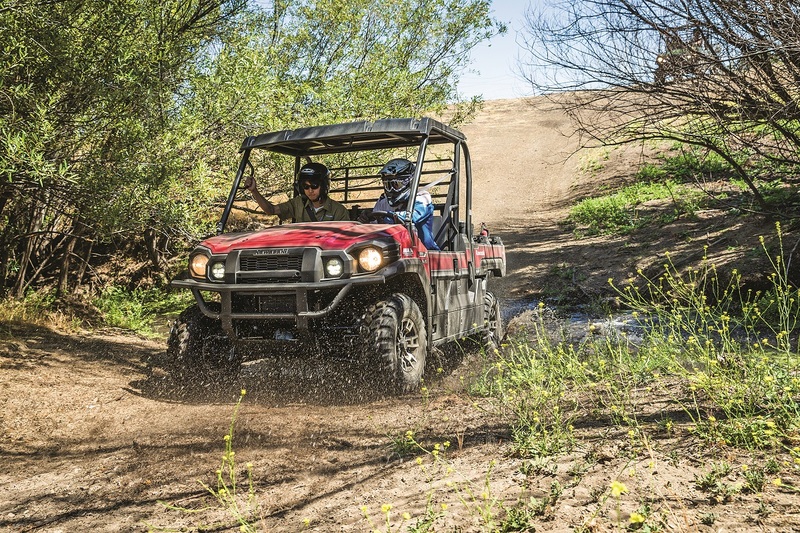 Impressive capacity is only part of what separates Kawasaki’s Pro-series Mules from traditional pure-utility UTVs; they also offer more power, suspension and refinement. The Mule Pro-FX starts at $11,999. The next step up is the $12,999 Mule Pro-FX EPS, and there’s a Mule Pro-FX EPS Camo for $14,199. Our test unit, the Mule Pro-FX EPS LE, with power steering, aluminum wheels and roof is also $14,199. The Mule Pro-FXT starts at $12,999 and ranges to $16,899. Honda’s Pioneer 700 starts at $10,299. 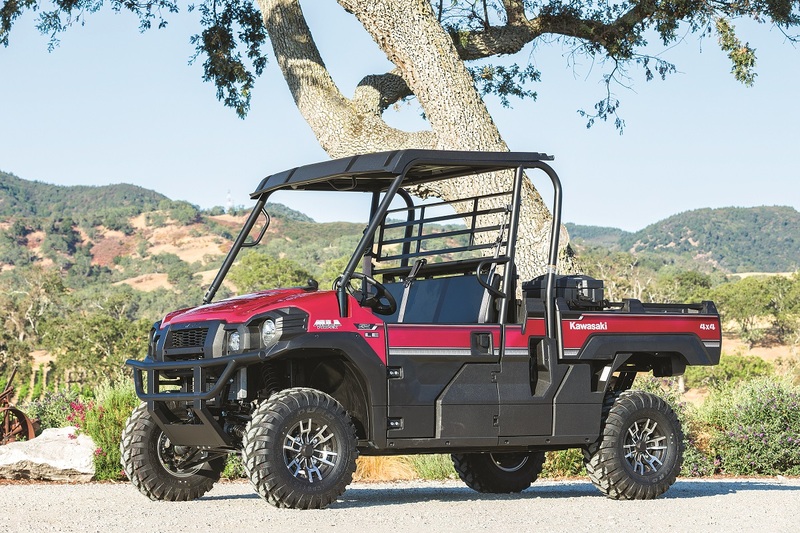 The full-size Polaris Ranger 570 starts at $9999. Prices for Yamaha’s Viking begin at $11,799. 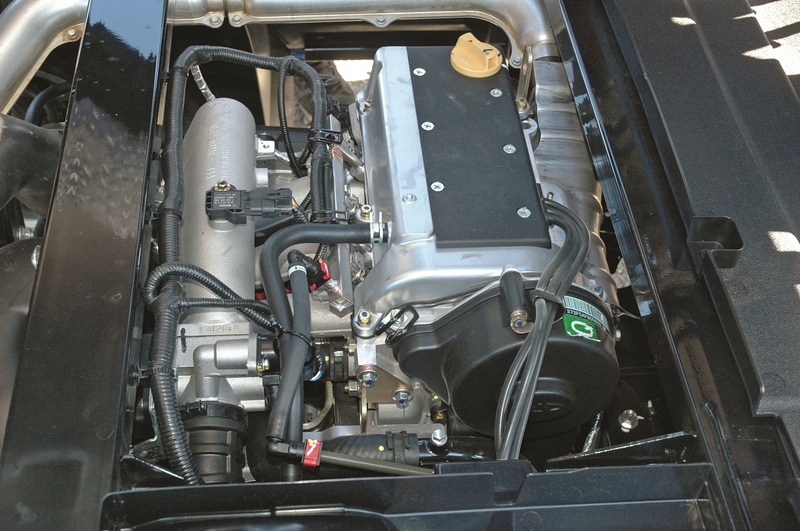 An inline, three-cylinder, double overhead-cam, 12-valve, 812cc engine. It’s the same mill that powers the heavier Mule Pro-FXT, so there’s plenty of power, and the triple’s smoothness and silence are almost car-like. If you’re used to utility UTVs that have a crude farm-equipment feel, you won’t want to go back. It doesn’t just haul cargo. Top speed is about 45 mph on dirt, and the acceleration is strong but not necksnapping. Compared to utility vehicles that are limited to 25 mph, it feels like one of Kawasaki’s bullet trains. HOW DOES THE POWER WORK ON THE TRAIL? The Pro-FX is all about low-end power, which makes steep terrain simple to conquer. This machine’s clutching and power delivery are tuned for smoothness, so you don’t have to be a master of throttle control to maintain traction on slippery trails. The Pro-FX’s steadiness also helps keep passengers calm and cargo in place when the trail gets ugly. WHAT KIND OF 4WD SYSTEM DOES IT HAVE? Selectable 2WD/4WD with a lockable rear differential. The rear differential unlocks to make tight turns easier and to protect delicate turf. 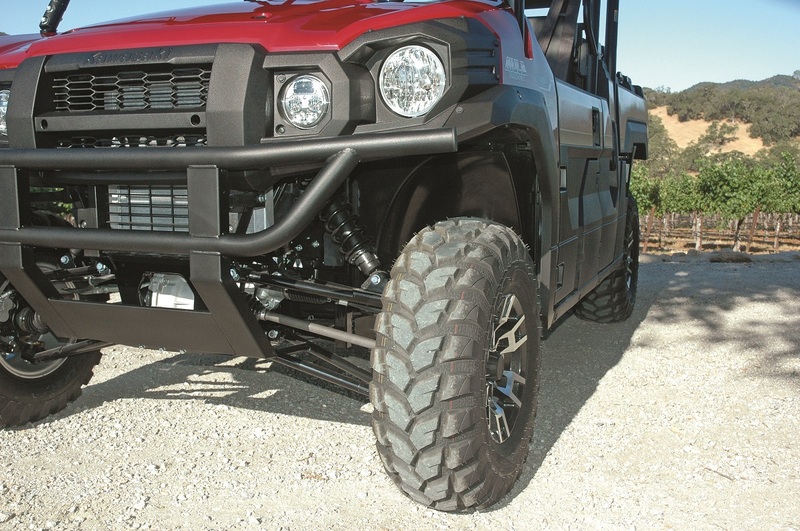 There’s no front differential-lock feature, but the Pro-FX can go anywhere a utility UTV should need to go. 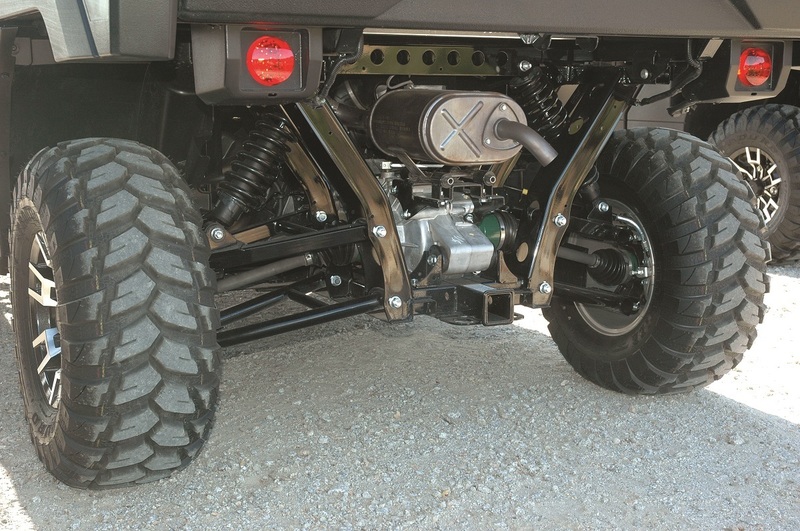 The double-A-arm front suspension has 8.7 inches of travel. The ride is outstandingly smooth for a utility machine. With double-A-arms front and rear, spring preload-adjustable shocks and 8.7 inches of travel at both ends, the Pro-FX’s suspension is more sport utility than utility. The deep travel does an amazing job of ironing out bumpy trails, and it can handle a reasonably quick pace and good-sized holes and ruts without bottoming. The rear shocks are spring preload-adjustable like the fronts. There’s no front or rear sway bar, so you’ll feel some body roll in hard cornering. There’s no front or rear sway bar on the Pro-FX, so there’s more body roll in fast corners than you’ll feel on sportier UTVs. 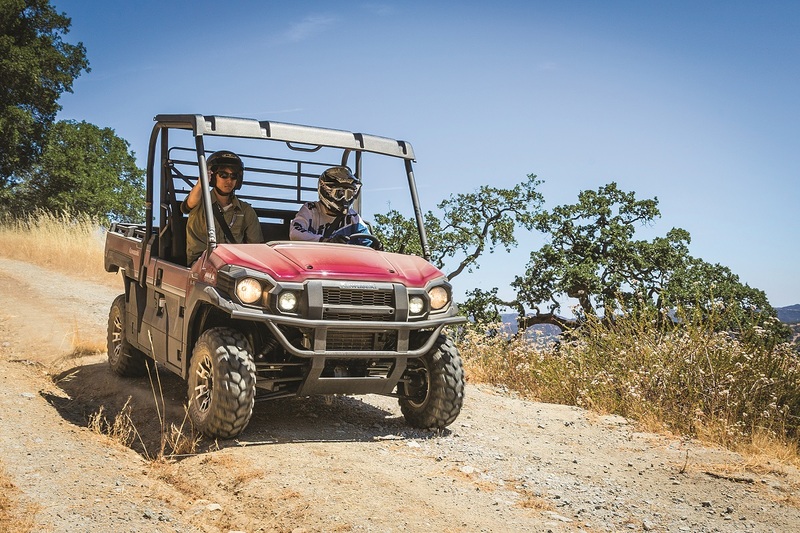 On many pure-utility UTVs you don’t get to feel fast cornering, so it’s hardly a problem. In normal driving the Kawasaki feels remarkably stable thanks to its wide 64-inch stance—the same width that keeps tall, long-travel machines like the RZR 1000 securely stuck to the ground. The power steering keeps effort at the wheel light and delivers excellent feel while it dampens jolts that bumps try to send through the steering wheel. Like a pro. We climbed some steep, dry, bumpy, traction-less hills so easily with the Pro-FX, we went looking for even scarier climbs. Smooth, naturalfeeling engine braking and four-wheel disc brakes make long, steep downhills a piece of cake. HOW IS IT IN DEEP MUD AND WATER? Less adventurous than some UTVs. The Pro-FX has the power for deep crossings, 10.4 inches of ground clearance, an effective 4WD system and good tires for slippery conditions. The only thing that might hold you up is the air intake, which is lower than the floor of the bed. It’s well-shielded under an access cover. The huge 54.1 by 53.3-inch tilting bed has a steel floor. It can hold a standardsize pallet and carry 1000 pounds. They’re very impressive. The Mule Pro-FX is so smooth and quiet, it’s easy to carry on a conversation with passengers while you’re on the move. That smoothness extends to the suspension’s plush ride and the quality feel of the shift lever and the door latches. Doors are always nicer than nets, and the Mule’s are very good. The service-access cover that gets you to the oil dipstick, air filter and battery without tilting the bed is very handy. There are a few things that could be better. The cab is roomy, but more room in the left footwell wouldn’t hurt. The bench seats are comfortable, but something more supportive would keep the driver and passengers in place better during aggressive driving. Massive hauling and towing capacity is only part of what separates Kawasaki’s Proseries Mules from traditional pure-utility UTVs. They also offer more power, suspension and refinement. 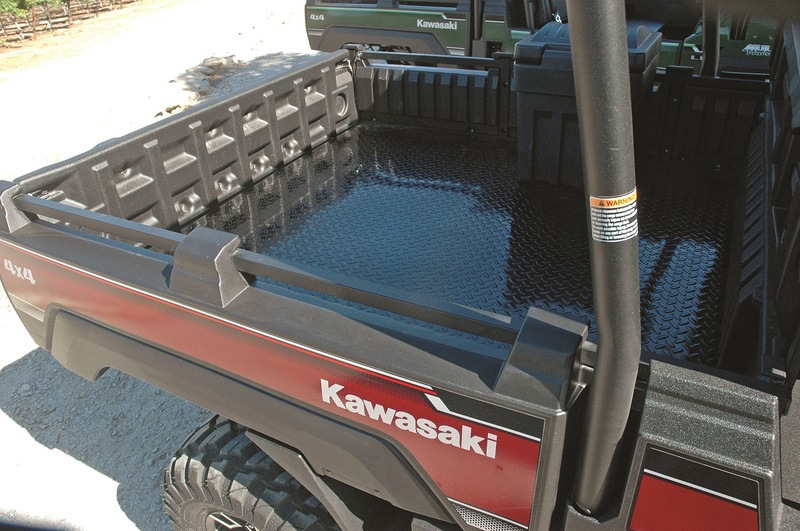 Kawasaki’s Mule Pro-FX changed how we think about pure-utility UTVs. Its hauling ability is amazing, but it pampers the driver and passengers instead of treating them like part of the cargo. 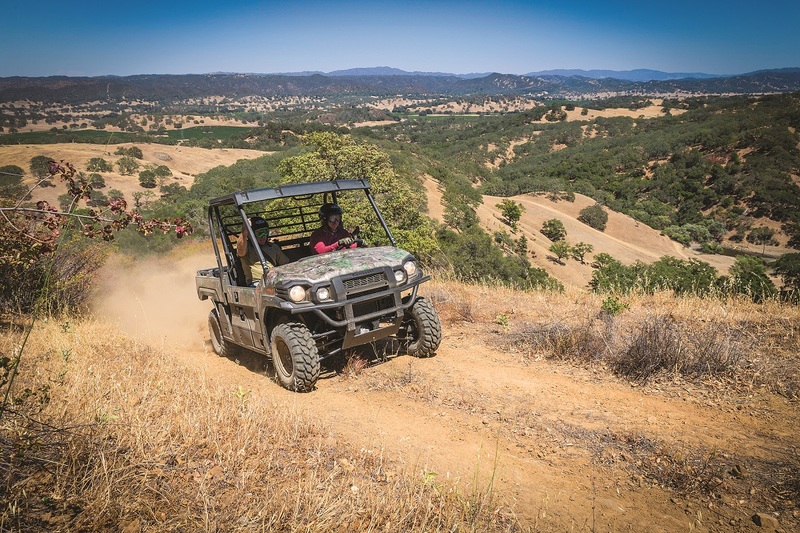 This isn’t a sport UTV, but for sensible driving, it’s more comfortable than sport machines in many ways, and it’s a great way to get around big job sites, ranches or hunting areas. Fuel capacity ……………………………………. 7.9 gal. Dry weight …………………………………… 1801.5 lb. Bed capacity …………………………………… 1000 lb.